The beautiful community of Berkshire Forest is located in Carolina Forest, South Carolina. The community consists of single family homes and condominiums. This wonderful community has quick and easy access to Highway 501, Highway 31, and International Drive. 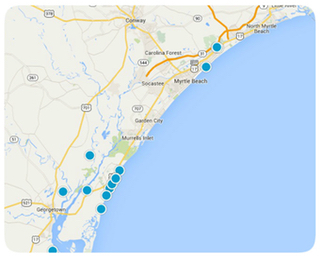 These main highways will take you anyarea in the Grand Strand in just a few minutes. Berkshire Forest is situated close to great schools, shopping areas, restaurants, Myrtle Beach’s amazing attractions, and only 6 miles from beaches. You will find many great amenities in Berkshire Forest, starting with a large lake that sits at the back of the community. There is a beautiful clubhouse that sits above the lake and it’s equipped with a fitness area, fully equipped kitchen, an onsite activities director, entertainment room, and an outdoor entertaining area. There is a beautiful swimming pool, bocce ball court, basketball court, and tennis courts here as well. Homeowners and their guests will be able to enjoy private beach club access at the Atlantic Resort, which sits in the middle of Myrtle Beach. If you are interested in purchasing a home in Berkshire Forest, contact us today for more information.